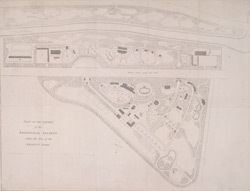 The title of this plan appears at lower left, along with scale bar and compass rose. The plan shows the animals' pens and enclosures numbered for reference. Opened to the public in 1828, in an area of Regent's Park laid out by Decimus Burton, London Zoo attracted 30.000 visitors in the first seven months. The collection of animals was expanded in 1830 by the arrival of the Royal Ménagerie from Windsor and again in 1835 when animals from the Tower of London were transferred to the zoo, including an Indian elephant, an alligator and over 100 rattlesnakes.